I am not sure if Henry Blodget of Silicon Alley Insider is playing devil’s advocate or if he really believes that Facebook opted for debt financing because it “couldn’t raise the rest of that $500 million round at that $15 billion valuation.” But his question is certainly legitimate and provocative. 1. This was a smart business decision: Even if Facebook could raise more money at a $15 billion valuation, it makes economic sense to use some minimal form of debt financing to pay for capex. It’s reflects the company’s maturation process. As my story shows, more and more startups are beginning to take advantage of debt financing. Moreover, as Lee points out, even at a discounted $5 billion valuation, $100 million in debt would give Facebook a paltry 2% debt-to-equity ratio. That hardly puts the company in risky territory even if the economy gets worse. 2. As crazy as this sounds, I think Facebook would have a decent shot at raising more money at a valuation at or close to $15 billion. Does that mean I believe Facebook is worth that much? No. But Facebook’s valuation doesn’t depend on my opinion. It’s based on the marketplace’s opinion. And already, two of the most successful business enterprises in the world (Microsoft and Hong Kong billionaire Li Ka-shing) have ponied up large slugs of capital at a $15 billion valuation. There’s dumb money, smart money and strategic money. And Facebook was shrewd enough and successful enough to take the strategic capital. Microsoft has helped Facebook generate advertising revenue while it gets its own ad business going, while Li Ka-Shing will open many doors for the company in Asia. Both of these players invested in the company at a valuation that most people couldn’t stomach because they believe they can generate more value on the asset compared to other entities that don’t bring as much strategic value to the table (and because they can afford to lose $100 million or more). This is exactly why News Corp paid a massive premium for Dow Jones. Is Dow Jones worth $5 billion? Probably not to anyone except Rupert Murdoch. Only time will tell if these moves were brilliant or boneheaded. But there is perverse logic at work here. So bottom line: I would venture that Facebook has a good chance at raising more money from another strategic-type investor at that seemingly irrational valuation–especially if it keeps growing its business and starts to figure out how to monetize social networks. Micro-Hoo: The End of Tech’s Soap Opera? Or the Beginning of the End? In this week’s broadcast of the Digital Dish, BusinessWeek reporters Spencer Ante, Heather Green, Arik Hesseldahl and Catherine Holahan wonder if the Microsoft/Yahoo dance is really over, and then size up Microsoft vs. Google and News Corp.’s slumping Internet revenues. Not to trumpet our horn too loudly, but we warned you about MySpace twice over the last six months. In fact, last November we first raised red flags about MySpace and how the pressure was on Rupert Murdoch to turn his prize quarry into a profit machine. Last night, SearchEngineWatch posted the full text of a letter Yahoo! chief exec Jerry Yang sent to its shareholders. The letter follows up on Yahoo!’s rejection letter to Microsoft, explaining why Yahoo!’s board believes Microsoft’s proposal significantly undervalues Yahoo and isn’t in the best interests of Yahoo stockholders. In the missive Yahoo CEO Jerry Yang emphasizes its strong brand, financial strength, strategic investments, technology, relationships with marketers and the huge opportunity in online advertising. It’s not very convincing. “We are executing our strategy – and making headway,” claims Yang. Not. What Miller’s letter shows is that most shareholders believe doing a deal with Microsoft is the best way to create more value for shareholders in the short term. It’s easy money up front, with no risk. To get the deal done, all Microsoft needs to do is sweeten that offer. Give Yang credit for restarting deal talks with News Corp. Forming some sort of combination with Fox Interactive Media may be just enough of a real threat to get Steve Ballmer to up its offer. Micro-Hoo: Is Microsoft following the HP Playbook or the News Corp. Playbook? Yesterday, I appeared on Fox Business News to talk about the latest and greatest soap opera in the tech industry–Microsoft’s courtship (or bear hug) of Yahoo!. On the show with my former colleague from TheStreet.com, Dagen McDowell, I said that Microsoft may be inclined to sweeten its offer to Yahoo! A new offer would never come close to the $40 a share that some insiders say Yahoo!’s board is seeking but I thought it was possible that Microsoft could come up a few dollars–especially since reports have said that Micrsoft was willing to pay around $35 for Yahoo! before its latest disappointing quarter. Now I’m not so sure about that. The reason is late yesterday Microsoft released a statement calling its bid “full and fair.” The remarks came in response to Yahoo’s earlier statement that Microsoft’s bid “substantially undervalues” the company. While Microsoft did not say $31 is its final offer, it is clearly playing hard ball. The question now is this: Is Microsoft following the HP playbook or the News Corp. playbook? (Microsoft has said that it studied the HP-Compaq merger as part of its due diligence for putting together a Yahoo1 bid.) HP applied a massive charm offensive and grueling lobbying campaign to win over Compaq shareholders. Rupert Murdoch, on the other hand, took over Dow Jones by giving the confused Bancroft clan a very sweet offer and then putting on the vice grips. Many analysts thought Murdoch would sweeten his offer to close the deal, especially since the Bancrofts held preferred shares in the company. But Murdoch held firm and quickly carried the day. I don’t know the answer to this question. But after yesterday, it looks like Microsoft is leaning more and more towards the Murdoch playbook. Now, don’t get me wrong. Yahoo! is no Dow Jones. The Silicon Valley superstar has fallen on hard times but it is not in a mature and declining business. And Yahoo! did not drive its business into the ground. It’s just competing against a superior competitor. The problem for Jerry Yang is that he has yet to convince shareholders that he has come up with a better vision to combining these behemoths. If he doesn’t, it’s hard to see how he can hold off Microsoft–or hit them up for more money. 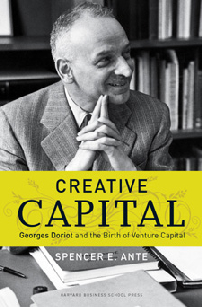 HOW TO BUY CREATIVE CAPITAL: To pre-order Creative Capital with a 30% discount, click here to go to Amazon.com.